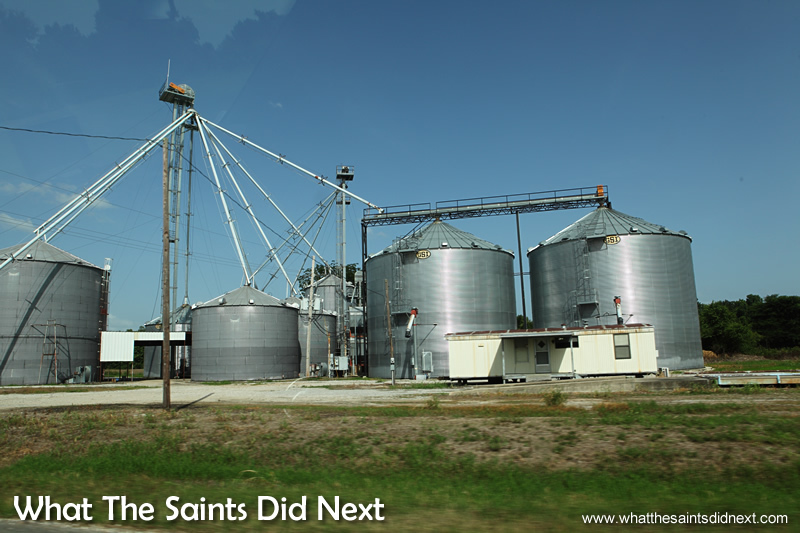 A typical Corn Silo or Grain Escalator, photographed from the car on our road trip. Taken in Louisiana. I remember Madonna wearing a bra with metallic style cones for cups in the 80s; or was it the 90s? It’s a strange vision to pop into my head driving through the vast farm lands in the state of Mississippi, USA, but up ahead is yet another cluster of fat, silvery steel cylinders, poking out from the green carpet of corn fields and we have been playing the guessing game as to what they could be. We ruled out water storage because of the conveyor belts on show. Water would have meant pipes. Wheat silos we took to calling them. But with some imagination (the road was long) we also speculated they could be missile silos, or a secret scientific research lab masquerading as a farm. It was also easy to picture a young Clark Kent running home from school leaving a rising dust trail; too many Smallville programmes, obviously. After stopping by the roadside to take photographs and speculate yet again on the mysterious cylinders up ahead, we decide to just go in and ask. 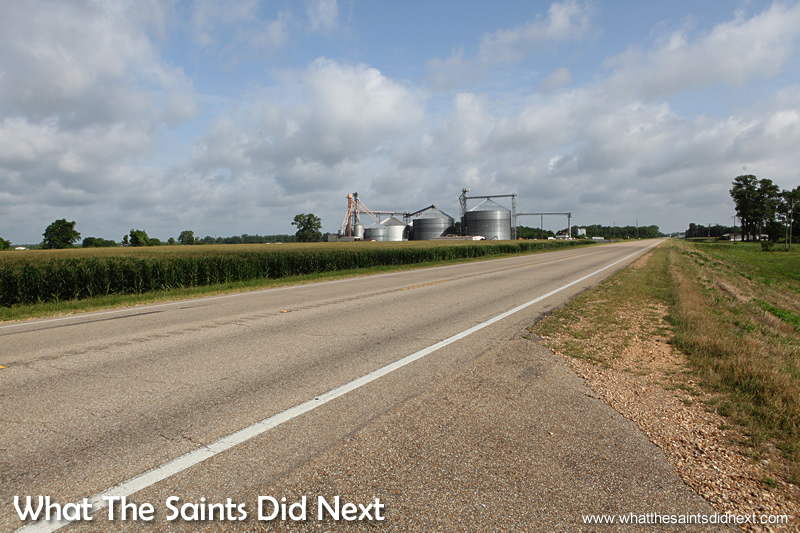 After stopping to take this picture of the corn fields and a Corn Silo, or grain escalator, in Mississippi we decided to pay them a visit. We pull off US Highway 61 and drive up right up to the complex. The silos tower above us. It’s surprisingly quiet, hardly anyone around apart from a couple of workmen in hard hats nearby. I’m directed to Curtis Brown, one of the four full time workers at the site. He is clearly busy, emerging from one of the larger cylinders covered in corn dust and wearing a miner’s light on his headband. I think our visit out of the blue like this has caught him off guard and he’s not altogether sure what to make of us. But he kindly agrees to show us around. The first thing we learn from Curtis is that this site is called a ‘grain escalator.’ It’s basically a large storage facility for harvested grain from farms in the surrounding area. It’s a cooperative ownership with the nearby farms. The tall towers support hydraulic conveyor belts with bucket type scoops which transport the grain up and into the corrugated steel tanks, or corn silo. 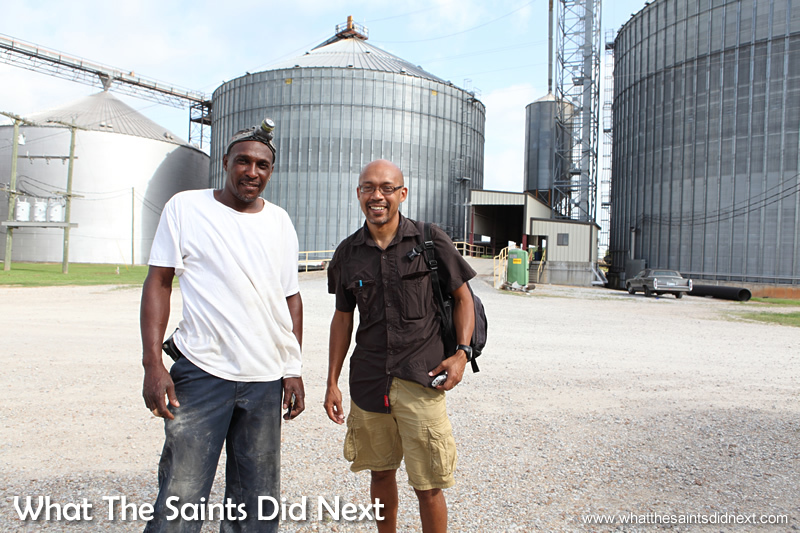 Meeting Curtis Brown at the grain escalator in Mississippi. I thought the operations might be seasonal, but Curtis informs me they are busy all year round. Although nearly empty now due to maintenance, the corn silo tanks will be filled again in about a month. 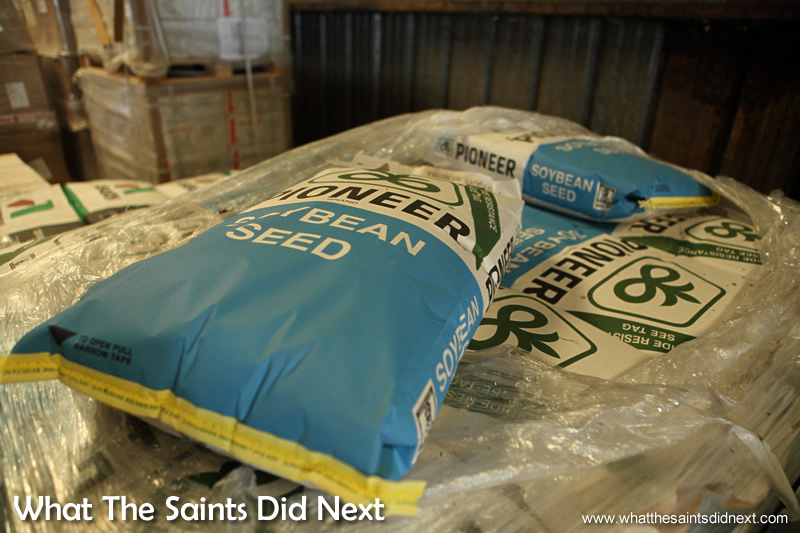 “We ship it out as fast as it comes in,” says Curtis, owing to the constant supply of grain coming in from the farms. 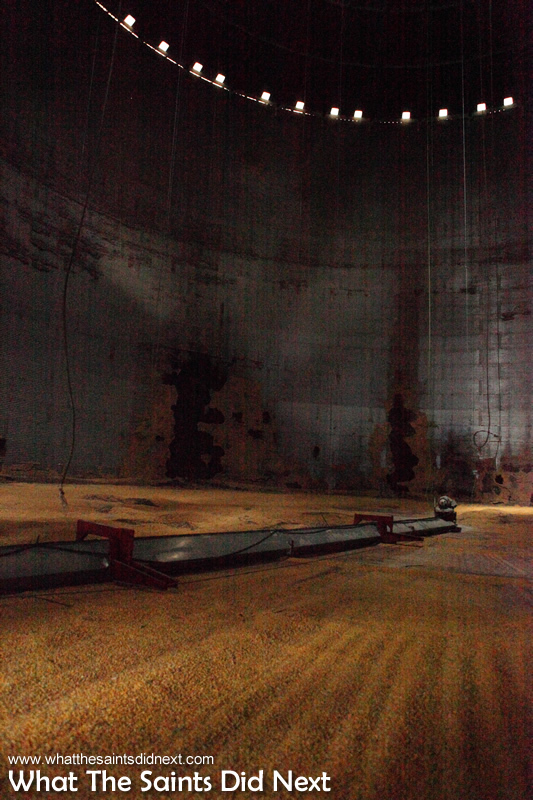 This grain is funnelled into trucks which are then weighed before being taken to barges and shipped to “stock yards” along the Mississippi River. The grain escalator up close. The trucks are weighed in the port on the left. The corn silo is huge from here. Soybean seed in the warehouse alongside the grain escalator. 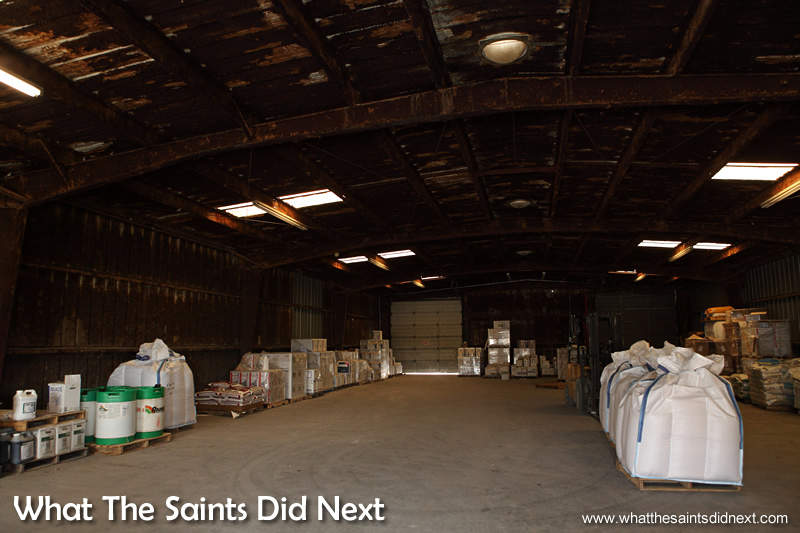 Inside the warehouse at the Grain Escalator. Curtis has worked on grain escalators for the last nine years: “My job, I weigh the trucks and maintain the building. We’ve got some guys been doing this 35 years altogether.” Although it only takes four people to run the escalator all year round because they are “easy” to operate, just “push a button to open the doors and make it happen.” Part-time labour is brought in during peak periods. The workmen I saw earlier are actually contractors working on electrical equipment. A corn silo nearby is undergoing maintenance; it’s nearly empty. Curtis agrees to let me have a look inside so up we go on the walkway and across a gantry to the lower access hatch. Inside the corn silo of the grain escalator. It is very dark inside and also stinks. Even though the corn silo is nearly empty there is still a lot of grain in the bottom of the tank. Curtis gives me a strange look when I ask to go inside, but he has no objection save to warn me my shoes will get dirty from corn dust. Inside the smell is powerful, like mouldy, stale beer. And the air is quite dusty from the grain; I can feel powdery particles in my mouth and nose. I thought I would get a great picture from inside, but it’s very dark and I have the camera ISO turned up to maximum. It’s huge in here. A circle of tiny holes at the top, way above let in pinpricks of sunlight like miniature spotlights. This is definitely not a secret missile silo, not unless you want to knock someone out with the smell. Imagine this whole space filled with corn grain. Inside the grain escalator. There are six storage tanks on this particular site. The largest has an 800,000 bushel capacity, but there’s also a 700,000 corn silo; a 500,000; two 300,000 and a small 100,000 bushel silo. In the US a bushel of corn grain (15.5% moisture) weighs 56lb or 25kg. 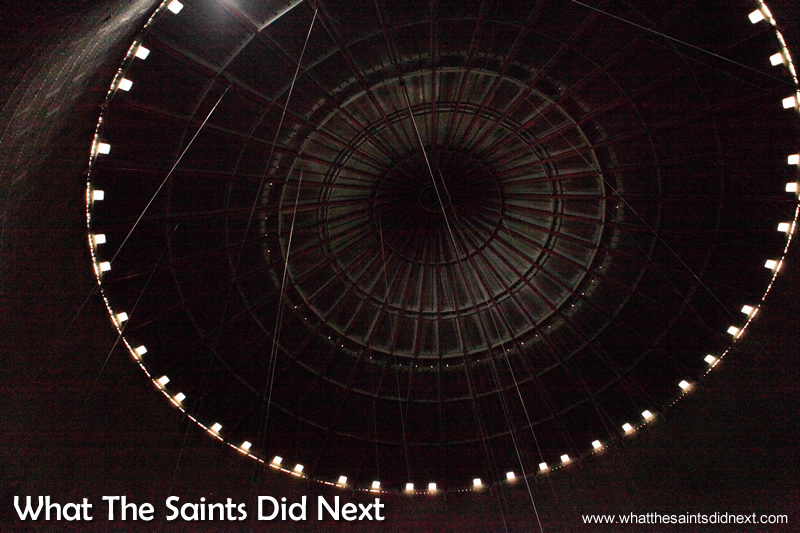 The ceiling of the corn silo from inside. Curtis shows us where the trucks are loaded and weighed and then he has to get back to work, telling us we are free to look around as much as we like. But really there’s not much else to see. After a short while we’re all done and jump back in the car to resume our road trip. We are really chuffed with ourselves for solving the mystery of the silver cylinders. You can die inside a grain bin in less than 60 seconds. And it happens. 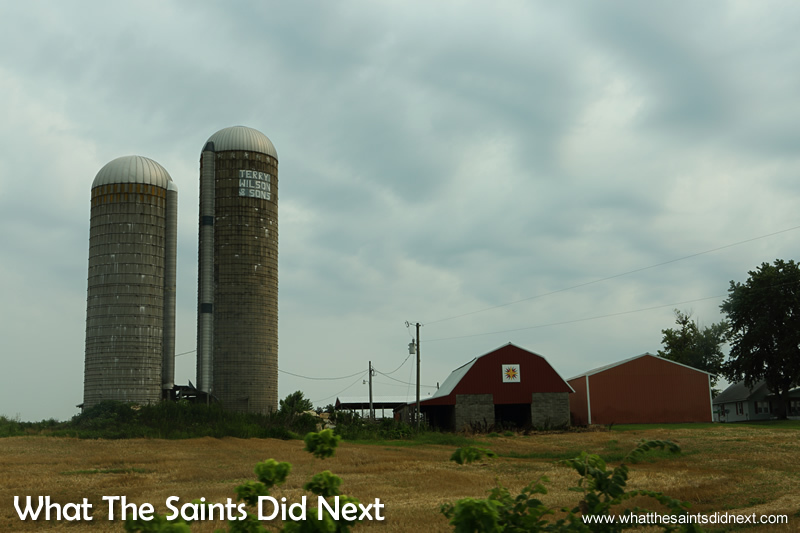 More than 900 people have died in the last 50 years by falling into corn silos and suffocating after becoming quickly submerged. I’m glad I found this out after our visit! Grain escalators in America can be dangerous places to work. The grain escalator was invented in 1842 in Buffalo, New York by Joseph Dart, Jr., to overcome the very slow, manual process of moving grain one sack at a time. They soon became a common sight all across America’s prairie lands and at major waterways and ports. 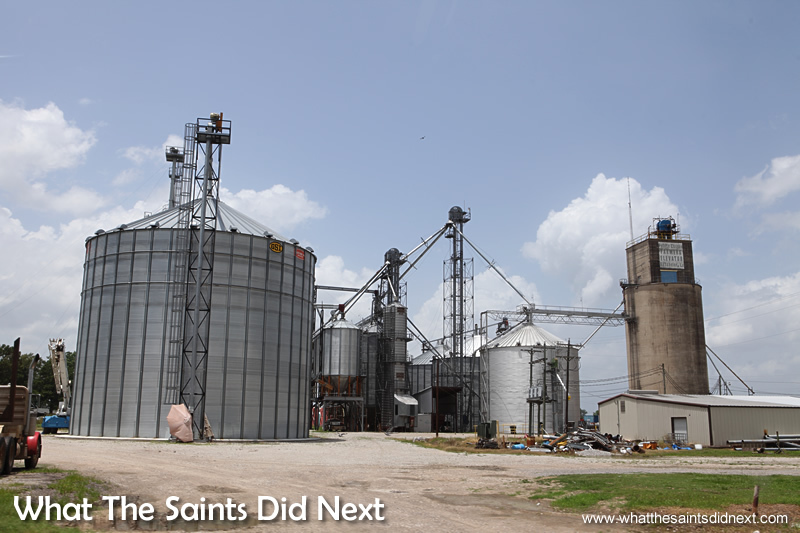 The early corn silo was made from wood but construction has since moved on to concrete or steel. 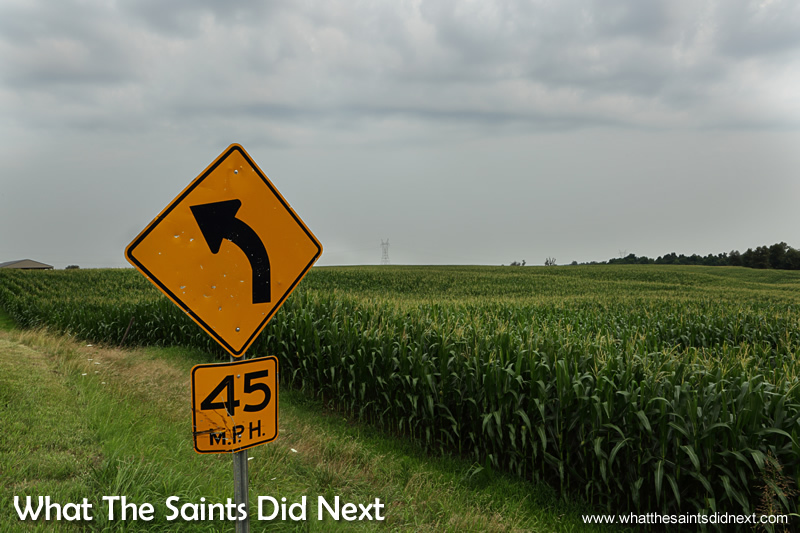 A typical corn field in America, right alongside the highway. This one in Kentucky. In the past, grain elevators sometimes experienced silo explosions. 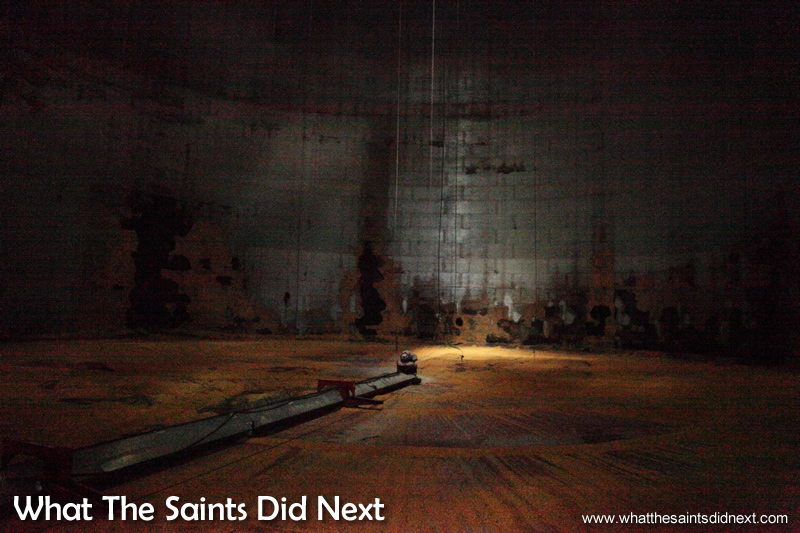 Fine powder from the millions of grains passing through the facility would accumulate and mix with the oxygen in the air. A spark could spread from one floating particle to the other creating a chain reaction that would destroy the entire structure. The United States is, by far, the largest producer of corn in the world, producing 32 percent of the world’s corn crop in the early 2010s. 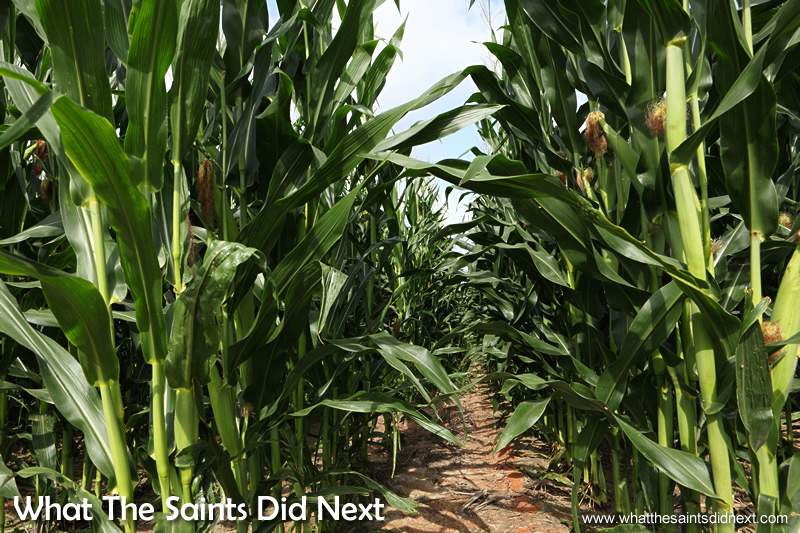 Corn is grown on over 400,000 US farms and about 20 percent of everything produced is exported. 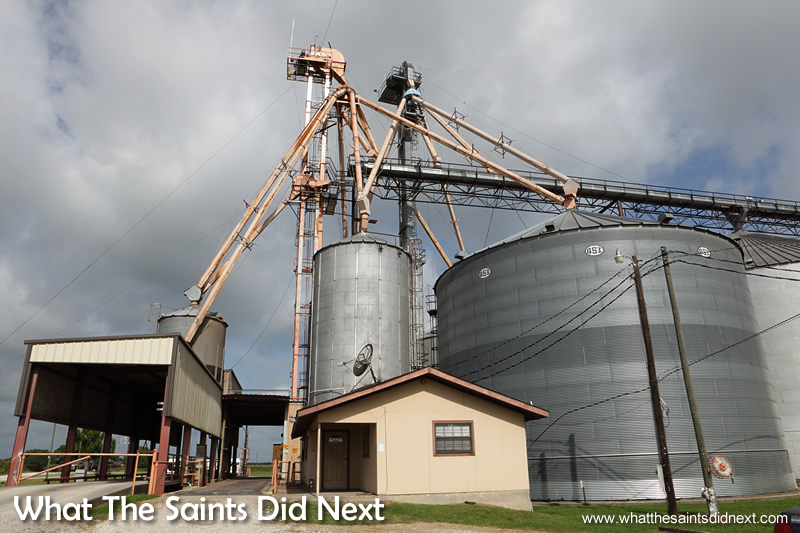 A grain escalator we passed in Louisiana. Photographed from the car while driving by. There are over two million farms in the US today. Each American consumes 25 pounds (11.3 kg) of corn annually. 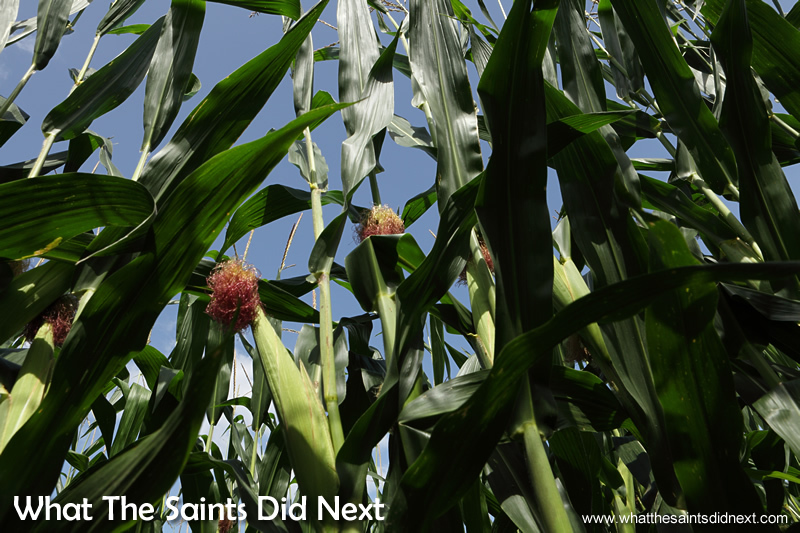 About 12% of the U.S. corn crop ends up in foods that are either consumed directly (e.g. corn chips) or indirectly (e.g. high fructose corn syrup). Concrete silos at this grain escalator in Kentucky. 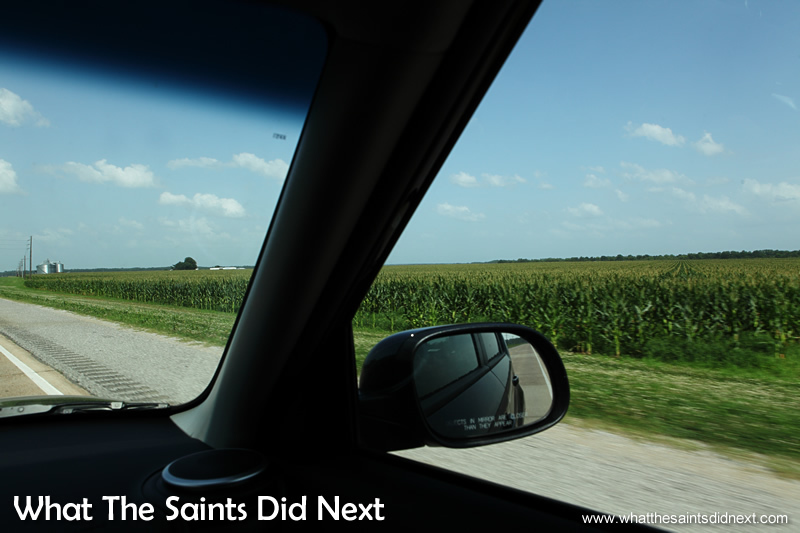 View from the car of a corn field in Louisiana as we drive by. Note there’s a grain escalator up ahead. Corn has a wide array of industrial uses including ethanol, a popular oxygenate in cleaner burning auto fuels. In addition many household products contain corn, including paints, candles, fireworks, drywall, sandpaper, dyes, crayons, shoe polish, antibiotics, and adhesives. The US is also the largest producer and exporter of soybeans, accounting for over 50% of the world’s soybean production. Soybean oil is used in the food industry, but surprisingly Soybean oil also makes its way into products ranging from anti-corrosion agents to Soy Diesel fuel to waterproof cement. America produces a third of the world’s corn grain. I had a friend that died when he fell in a corn silo, it was like falling in quick sand. This is a dangerous job. Sorry to hear that Larry. 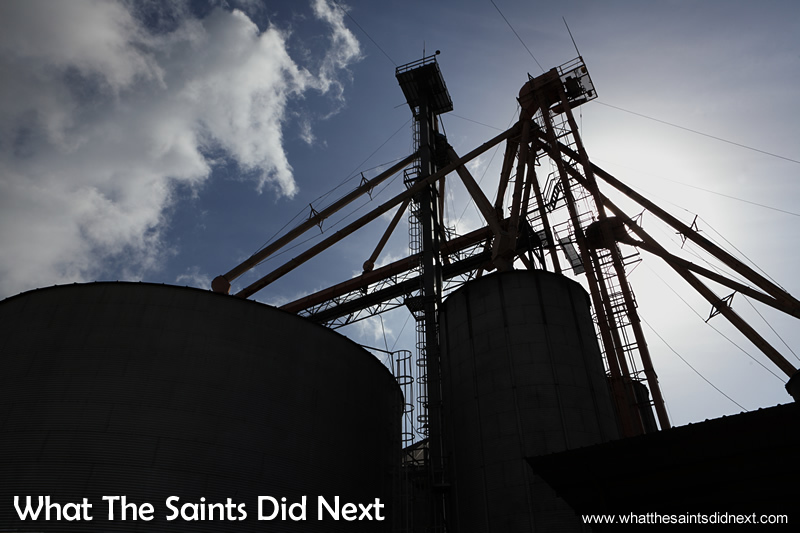 When I was researching this post it was quite horrifying the stories I found about accidents in the silos. It’s not immediately obvious just how dangerous this job can be.